Today Aubrey and I read Noah and the Great Flood. 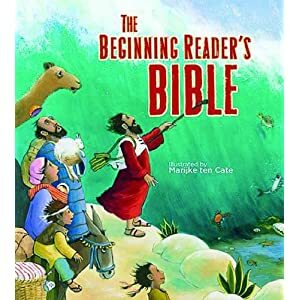 It is one of the stories in The Beginning Reader's Bible. I love this bible because it has true bible text and the illustrations are beautiful. It is fast becoming one of my favorite children's bible. After we read the story, Aubrey made a rainbow. First, I took a piece of construction paper and made 6 rows. In each row, I put a dot to represent each color of the rainbow. Next I cut strips of construction paper from each color of the rainbow. Then I had Aubrey cut the strips into pieces. Once she was done with the cutting, she used a glue stick to put glue all over the paper. She put the pieces on one row at a time. I asked Aubrey what the rainbow reminds us of when she was finished. She said, "That God will never again send a flood." So adorable! Nothing is sweeter to me than knowing my children are growing in their knowledge of God and his Word!